Background: Many countries face substitution from formal to informal care. It is essential that a sufficient number of caregivers, such as family, friends or neighbors, are willing and able to lend care to address the needs of ill or elderly persons. We investigated whether the general public, who might become caregivers in the future, and current informal caregivers align with the shift to more informal caregiving. Methods: We studied the views on the responsibility for care of the general public versus the government, and whether these views differed among groups with diverse past experiences with care in terms of own health problems or previous caregiving activities. Data (n = 1097) was collected among the Dutch Health Care Consumer Panel with a survey in October 2015. 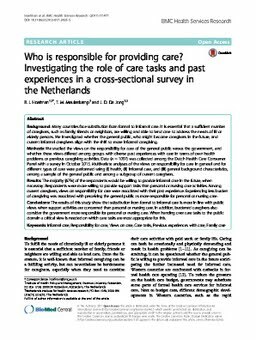 Multivariate analyses of the views on responsibility for care in general and for different types of care were performed using (i) health, (ii) informal care, and (iii) general background characteristics, among a sample of the general public and among a subgroup of current caregivers. Results: The majority (67%) of the respondents would be willing to provide informal care in the future, when necessary. Respondents were more willing to provide support tasks than personal or nursing care activities. Among current caregivers, views on responsibility for care were associated with their past experience. Experiencing less burden of caregiving was associated with perceiving the general public as more responsible for personal or nursing care. Conclusions: The results of this study show that substitution from formal to informal care is more in line with public views when support activities are concerned than personal or nursing care. In addition, burdened caregivers also consider the government more responsible for personal or nursing care. When handing over care tasks to the public domain a critical view is needed on which care tasks are most appropriate for this.